The Deal: bikes are available Now- see pull down menus Warning: At the special Price, many sizes always sell out prior to arrival dates. *Order now to lock in your sale price and selection. The price may go up $100 or more when sales goals are met. 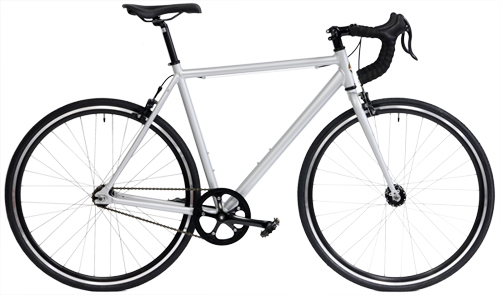 Handbuilt, high-strength, Lightweight Aluminum frame. This Single-speed track bicycle ships with a freewheel and brakes. Performance: The track wheelset with Aero Rims is normally only found on bikes starting at $800. Comfort and Control: Motobecane Fixie Record, Drop Bar Track Bikes can be set up for a fast aero position. You get Supreme control with the sweet spec Road Drop Bar. Sizing is a personal choice. The final decision is up to the customer. Between sizes? Size down for short arms/upper body or more straddle clearance. Size up for longer arms but you may touch when you straddle the bike. 4' 10 up to 5' 1"
5' 1 up to 5' 4"
5' 3" up to 5' 7"
5' 7" up to 5' 9"
5' 9" up to 5' 11"
5'11' up to 6' 1"
6' 1" up to 6' 6"
VP-A71 STEEL BLACK W/M-1D ALLOY BLACK TOP CAP.